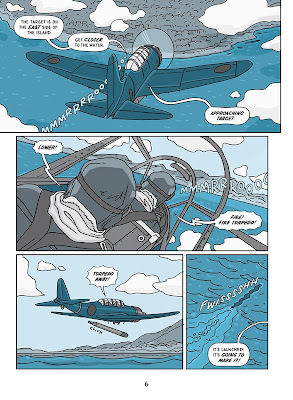 Since the first book in the Nathan Hale's Hazardous Tales series was published in 2012, kids and adults and history teachers and comic book fans have been waiting to see how he'd tackle a favorite topic: World War II. We had to wait until last fall to get it, but Nathan Hale (author, not patriot)(I mean, I'm sure he's a patriot)(not the patriot spy though) doesn't disappoint. Nathan Hale's Hazardous Tales: Raid of No Return doesn't attempt to tell the entire story of World War II. Towards the end of the book, narrator Nathan Hale (this one is the patriot spy) explains that this is only one story of many, and it will take many books to tell those stories. Instead, as he did with the Revolutionary War and Civil War, Hale (actually just assume it's both Hales) uses a smaller event within the war to tell the larger story. In this case, it's the Do0little Raids on Japan. Going in, I didn't know much about the Doolittle raids, other than that they were featured in that Pearl Harbor movie (creatively titled Pearl Harbor) where Captain Jimmy Dolittle was played by Jack Donaghy Alec Baldwin. The raids were an American air strike against Japan, the first to reach the Japanese home islands. The attack was launched from aircraft carriers, and was a one-way mission; if the pilots and crews survived, they were to land in China and work their way home from there. As with the other books in the series, Hale (uh, both) does an excellent job of providing context for the relatively limited events showcased in the book. This means laying out the increasing aggressions of the Japanese in the fifty years leading up to World War II. In the United States, we often just talk about Pearl Harbor coming out of nowhere, but in fact the Japanese had been building their power empire in a series of invasions and wars against Russia, China, French Indochina, and other nations and territories beginning in 1894. This positioned Japan with one of the most powerful navies in the world, with uncontested dominance of the eastern Pacific. They were bound to run up against Hawaii sometime. 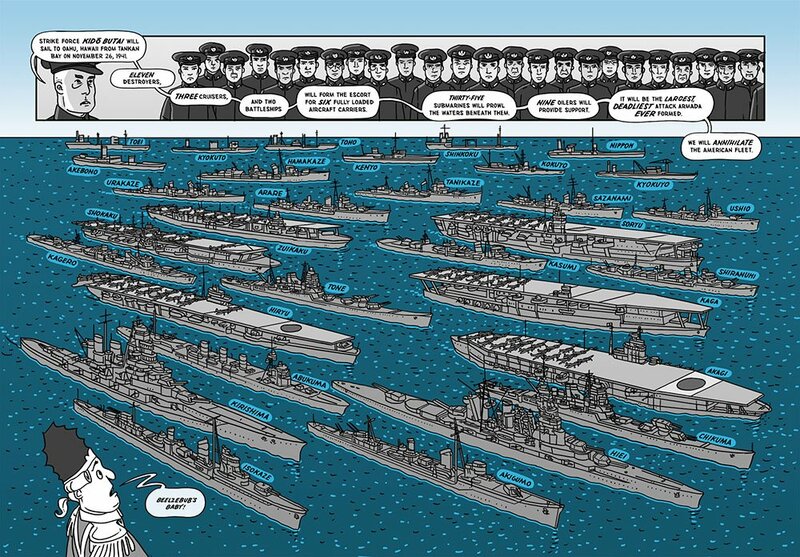 We mostly see the attack on Pearl Harbor from the side of the Japanese, and Hale (whoever) does a great job of laying out the purpose, events, and success of the attack. For being the worst attack on American soil in the twentieth century, Hale manages to tell the tale with his now-patented balance of exposition, excitement, suspense, and even humor--somehow while maintaining a reverence and respect for lives lost on both sides of the battle. 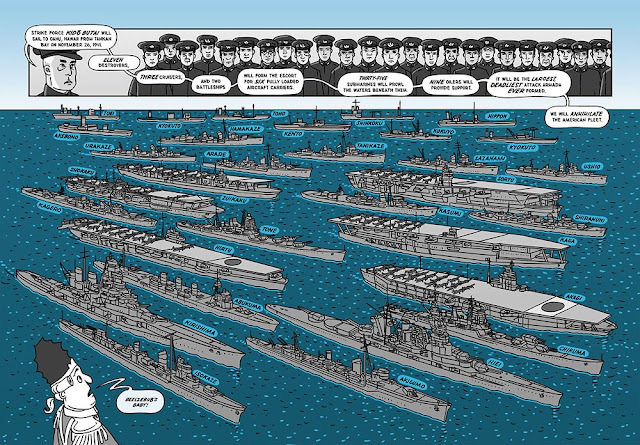 As a history teacher, I appreciate the way he uses maps and diagrams to help explain the strategic and tactical side of these battles; as a comics reader and dad, I love that he's able to bring the personality of the individuals involved to life. There are a lot of graphic novels out there about World War II, but many of them have the cold distance of a textbook with illustrations added; Hale truly marries the text and pictures, so that each supports the other. The bulk of the book is about the Doolittle raids themselves; we see the technical problems of launching sixteen B-25 bombers from the deck of an aircraft carrier, the secrecy of the mission, even to the pilots and crews who were flying to Japan. In this age of GPS-guided missiles and drone strikes, it's jarring to see men flying in tin cans and dropping bombs with gadgets that are only a few steps removed from line-of-sight opening a door and throwing it out the window. Hale explains all of this in a concise but thorough way, building more context for the heroism of these soldiers as he goes. One of the things that's rarely explained in the history books is what happened to the pilots and crews after their successful mission. Some escaped to safety with the help of the Chinese; others were captured by Japanese and held in P.O.W. camps until the end of the war. A few managed to land and trek across the Himalayas to India (!!!) where they were able to make their way home. And several of them die, either in the immediate aftermath of the raids or executed as prisoners of the enemy. Each of these stories would make a book in their own right, but Hale gives us more about the lives of these men than I've ever seen before. As Hale wraps up this Hazardous Tale, he explains that the Doolittle Raids were successful, but their significance wasn't the strategic win, it was the emotional win. The boost to morale that it brought to the Pacific Theater, which had seen nothing but losses to the Japanese navy for all of 1942. The realization that the Japanese weren't invulnerable, and the renewed motivation for the crews of the ships and planes that would be needed to keep fighting. Hale lists twenty-one other battles over the next three years, ending with the bombing of Hiroshima and Nagasaki. Hale is able to give an overview of a significant historic event while still giving us a very personal story about how the individuals of history made a difference. It's not always the "big names," but the everyday guy, the pilot, the crewman, the soldier, the mechanic who make history. The end of the book includes a coda about the men of the Doolittle Raids; only one was still living as of 2017. This reminder that the Greatest Generation is nearly gone is sobering. 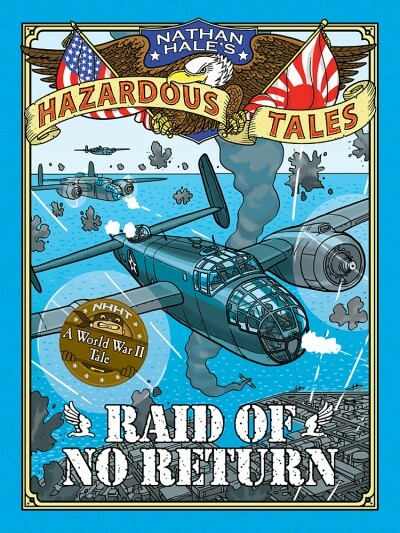 Hale gives us insight into the writing of the book, including his bibliography, his experience learning how to draw B-25s, and where readers can get more information about World War II and the raids themselves. We're also left with a tease -- we have seven books in the Hazardous Tales series so far...what's next? My 13 year old and I are hoping for the Civil Rights Movement, but whatever Hale delivers next, we'll devour. He's making history cool, and we've got a front row seat.